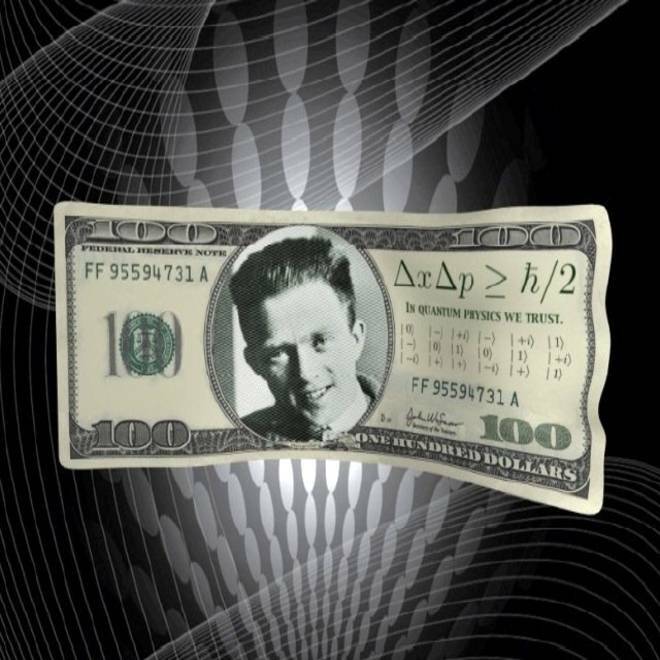 A quantum $100 bill bears a picture of Werner Heisenberg and the motto "In Quantum Physics We Trust." • Can quantum physics stop credit card fraud? Researchers have laid out a couple of schemes that banks and their customers could use to verify transactions using delicate quantum systems in the Proceedings of the National Academy of Sciences. The two methods involve the transmission of "quantum tokens" or "quantum tickets" that are essentially rendered useless once they're read and compared with the codes that are held securely by the banks. One of the key issues is determining how many errors should be tolerated in the transmission. "We can deduce from theory that on average no more than 83 percent of the secret digits may be duplicated correctly by a counterfeiter. Under realistic conditions, we can assume that an honest participant should be able to recover 95 percent of the digits. If now the verifier sets the tolerance level to 90 percent, it will be almost impossible to accept fraudulent tokens or to reject an authentic holder," Fernando Pastawski of the Max Planck Institute of Quantum Optics said in a news release. • Who will win the quantum communication race? Wired's Adam Mann provides an in-depth update on the "quantum teleportation space race." We're not talking about teleportation Star Trek-style, but about a system that allows for unhackable data transmission between distant points by sending quantum states back and forth, typically in the form of entangled photons. Just a few months ago, European researchers one-upped their Chinese counterparts in claiming a distance record for quantum teleportation (88 miles). Now a number of countries are planning space-based experiments that involve quantum teleportation: Japanese researchers are reportedly working on a small-scale experiment that could be conducted using the Socrates satellite, due for launch in 2014. But it's the Chinese who appear to be the most serious about proving out the technology, with plans to launch a satellite with quantum teleportation capabilities in 2016. "We hope we will be the first real experiment in space," Pan Jianwei, project leader for the Quantum Science Satellite, told the journal Science in June. The U.S. appears to be behind the curve, although there are suggestions that classified research on space-based quantum communications is under way. • When will quantum computers enter the mainstream? Technology Review's Tom Simonite pays a visit to D-Wave Systems' quantum computing operation in Canada, which has attracted $30 million in its latest equity investment round. Among the investors: Amazon.com billionaire Jeff Bezos and the CIA's In-Q-Tel investment arm. Why the CIA? "Our intelligence community customers have many complex problems that tax classical computing architecture," Robert Ames, In-Q-Tel vice president in charge of information and communication technologies, said in D-Wave's news release. "We believe our customers can benefit from the promise of quantum computing, and this investment in D-Wave is a first step in that direction." D-Wave made a splash five years ago when it claimed that it had created the world's first commercial quantum computer, but observers voiced deep skepticism at the time. Last year, D-Wave researchers and their academic colleagues published a paper in Nature to support the quantum claims, and the company has sold one of its computers to Lockheed Martin for $10 million. Simonite quotes D-Wave as saying more evidence — and more customers — will be forthcoming. • Could quantum physics put a kink in causality? Quantum confusion over causality is a classic plot device in science-fiction movies ranging from "Back to the Future" to "Timeline" to "Looper" — but physicists report in this week's issue of Nature Communications that such confusion may be science-factual as well. Traditionally, causality requires that if A causes B, then B cannot cause A. But the researchers from the University of Vienna and the Universite Libre de Bruxelles point out that quantum physics allows for situations in which A causes B causes A. They say such situations would involve quantum systems that are in a state of superposition — for example, Schrödinger's dead-and-alive cat, or a quantum bit that holds a value of 1 and 0 simultaneously. "The real challenge is finding out where in nature we should look for superpositions of causal orders," the University of Vienna's Caslav Brukner said in a news release. Brukner and his colleagues point to a model for future circuitry that would connect quantum logic gates with "wires" in superposition. Such circuitry "may allow creating situations in which events are not localized in time," they write. Does this mean it'd be theoretically possible to go back in time and kill your grandfather, in accordance with the classic time-travel paradox? The researchers say no. "Our framework ... is by construction linear and in agreement with local quantum mechanics, and yet paradoxes are avoided, in accordance with the Novikov principle, due to the noise in the evolution 'backward in time,'" they write. All this makes me feel as disoriented as Schrödinger's cat in a dark, dark box — but you've got to admit it's intriguing. Feel free to leave your own quantum quips as comments below.